Dinner at a TBD location and time! We'll have more info and instructions on how to RSVP available soon. This will start when bessyboo and revolutionaryjo arrive on site and run the duration of the con, so don't feel like you HAVE TO be at the venue by 8:45am! Room 107 - Saturday, 9:00 A.M. Welcome to Podfication! Announcements, land acknowledgement, and other important information. Room 107 - Saturday, 9:40 A.M. It's that time again! Join your friends and guess your way to team victory by picking out narrator, fandom, and fic from short clips of audio. Room 107 - Saturday, 10:50 A.M.
We’ll start by having those who were around in early podfic fandom share memories of what it was like and major changes that have happened since then. Next, we’ll reflect on podfic fandom at present and what major qualities and questions define it. Finally, we’ll imagine into the future of podfic fandom, talking about what we’d like to see come next. Saturday, 11:50 A.M. - 12:50 P.M.
We'll have sandwich fixings available in the kitchen area for any attendees who would like to partake! Room 107 - Saturday, 12:50 P.M. Need help organizing a really long podfic you wanna do but can't even figure out where to start? Want advice on how to organize/produce a massive multivoice? Need to workshop an experimental thing that you have the idea for but can't figure out? Need help with this one effect/mouth noise that you can't get right/rid of? Need someone to cheer you on while you send that permission request that you have always dreamed of? Bring your podfic or project or idea and we'll work together to help make that project not so daunting anymore. Room 107 - Saturday, 2:00 P.M.
Sound effects can really amp up a podfic, give greater clarity to unusual narrative structures, or simply be a fun challenge to play with! We'll talk through different ways you can use sound effects, where to source noises from, provide technical how-to information, and give some examples of our favorite podfics with sound effects. 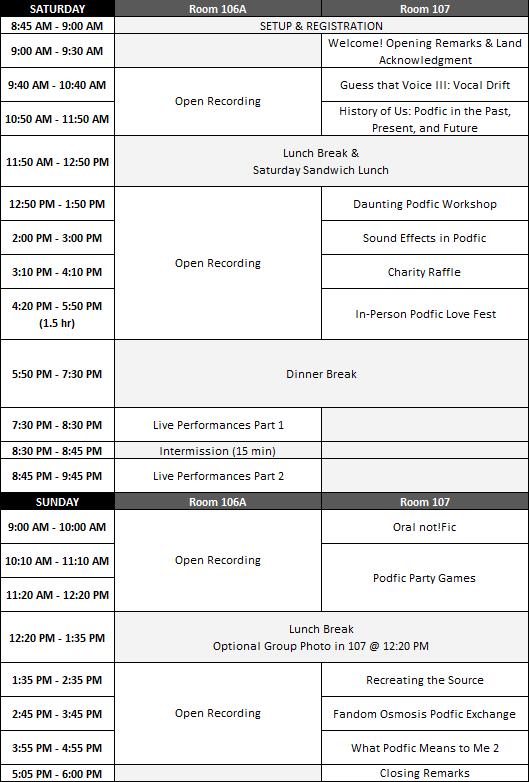 Room 107 - Saturday, 3:10 P.M.
Podfication’s first ever raffle for charity! Proceeds will go towards the American Foundation for the Blind (or the charity of your choice) to provide more audiobooks to more people. Room 107 - Saturday, 4:20 P.M. This event is an opportunity to enjoy listening to podfic in a room of people who love it as much as you do—sharing aloud the laughter, gasps, and sometimes even tears that great podfic inspires in us. But beyond that, it’s an opportunity for podficcers, who often receive little feedback, to have a few minutes of this con dedicated to showering them with in-person appreciation by fellow members of their community. 5:50 P.M. - 7:30 P.M.
Room 106A - Saturday, 7:30 P.M.
Live readings from your fellow Podfication attendees! Intermission from 8:30-8:45pm. Room 107 - Sunday, 9:00 A.M. Returning once again, join us to find out what story we'll create together this year. Come be part of the fun and share your ideas, or just listen in on the hilarity. Room 107 - Sunday, 10:10 A.M.
For the first half of this double panel, we’ll work together to come up with ideas for podfic party games (games or activities that podficcers can do when they meet up in person). These could be original ideas or could involve putting a podfic-themed twist on games that already exist—think podfic twister, podfic spin the bottle, podfic musical chairs, podfic HORSE, etc. We’ll collect ideas and hammer out the rules for as many as we can in the allotted time. Then, in the second half of the panel, we’ll choose our favorites of the games/activities we’ve created and we’ll play-test them together! 12:20 P.M. - 1:35 P.M. Optional group photo in room 107 at the start of the break. Room 107 - Sunday, 2:45 P.M. So you want to sound just like an episode of Night Vale/Unsolved/etc. Let's talk about what goes into recreating a source's soundscape in podfic form! Bring a short (1k or less) fic for an obscure fandom you love to this panel and we'll match you up with another panel attendee who knows nothing about that fandom. You'll have two minutes to tell them why you love that fandom and what's important to know about it, and the same for them to tell you about their choice. Then we'll all go record our short fics in new-to-us fandoms, and maybe have a little time afterwards for folks who are particularly pleased with what they have created to share. Room 107 - Sunday, 3:55 P.M. Following up on the 2016 panel, we'll sit back down as a room full of people who are passionate about podfic and talk about what it means to us, how it's changed our lives, and how that relationship has evolved over the two years. Room 107 - Sunday, 5:05 P.M.
Farewell and last minute important information that needs to be relayed. You didn't think we'd leave you hanging after closing remarks, did you? If you can, join us for dinner at a TBD location and time! We'll have more info and instructions on how to RSVP available soon.